The educational coding toy for girls is going up against the Sharks to raise funding and brand awareness. SmartGurlz, the world’s first coding robots designed just for girls, will appear on ABC’s Shark Tank Nov. 12. SmartGurlz is a fun yet educational toy that inspires girls to use their minds and imaginations by harnessing their love for role playing. As they code their way through interactive stories and engaging activities, they learn how to make their self-balancing robots and action dolls dance, drive, and do tricks. Why are SmartGurlz a smart choice? Empowering – Each doll has its own back story, personality, and intriguing interest from science to tech to mechanics. Educational – Girls learn all about STEM (science, technology, engineering, and math) principles through play. Easy-to-Learn – Their proprietary SugarCoded app for smartphones and tablets breaks the coding process down into simple assignments. 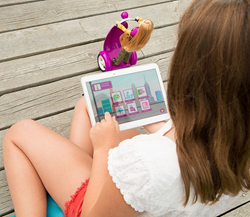 Fun – SmartGurlz is simply a whole new way to engage with their favorite type of toy and playtime activity. In addition to promoting education at home, SmartGurlz gives back to educational programs in underserved communities around the world, including BlackGirlsCode, Morrison Mentors, and Digipippi. To learn more about SmartGurlz, tune in to ABC’s Shark Tank on Sunday, Nov. 12 at 9/8c. SmartGurlz is a brand born from necessity. Sharmi Albrechtsen created the world’s first self-balancing coding robot for girls to help her own daughter take an active interest in STEM education. Now her creation is traveling the world and inspiring the women inventors, engineers, mathematicians and more of tomorrow, today.